Another round of Dave Chappelle surprise San Francisco shows has been announced! He will be performing at Punchline SF on Tuesday, December 13 and Wednesday, December 14th and tickets will sell out in a flash. Tickets will be $75 on Ticketmaster. Dave has been seen around the Bay Area a lot in the past few years. He has a home here and has been doing small, surprise shows at The Chapel, Cobb’s and Punchline, which are typically announced a few days before tickets go on sale. 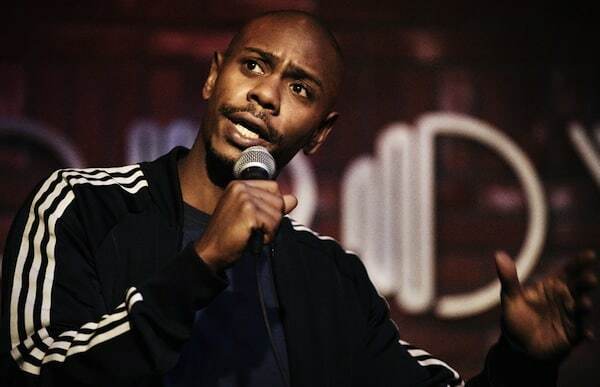 Chappelle is now enforcing a strict no-cellphones policy at all of his shows, after becoming frustrated with audiences who are too busy taking video of his sets than paying attention to the comedy. Please note that this is a strict NO CELL PHONES ALLOWED show. Please leave your phones in your cars or at home. Anyone who brings a cell phone will be required to place it in a lockable pouch. Everyone is subject to a pat down. Anyone caught with a cell phone inside the venue will be immediately ejected. This event is WILL CALL ONLY, and there is a 2 ticket limit per customer. You will need to bring your government issued photo ID and credit card to the box office on the day of the show to retrieve these tickets. Once your order is picked up you must directly enter the venue and there will be no ins and outs. ** Will call tickets must be picked up by the card holder only. Alternate names for will call will not be allowed. ** LIVENATION AT ITS DISCRETION WILL CANCEL ANY AND ALL ORDERS WITHOUT NOTICE THAT EXCEED THE TICKET LIMIT. THIS INCLUDES DUPLICATE ORDERS HAVING THE SAME NAME OR CREDIT CARD. David Khari “Dave” Webber Chappelle is an American stand-up comedian, screenwriter, producer, and actor. After beginning his film career in 1993 as Ahchoo in Mel Brooks’ Robin Hood: Men in Tights, he landed supporting roles in box office hits including The Nutty Professor, Con Air, and Blue Streak. His first lead role was in the 1998 comedy film Half Baked, which he co-wrote with Neal Brennan. In 2003, Chappelle became more widely known for his sketch comedy television series, Chappelle’s Show, also co-written with Brennan, which ran until his retirement from the show two years later. By 2006, Chappelle was called the “comic genius of America” by Esquire and, in 2013, “the best” by a Billboard writer. The show continues to run in late-night syndication and on television networks around the world. Dave has continued to perform stand-up across the country, performing over 500 shows in the past three years, including 10 sold-out shows at Radio City Music Hall in 2014. Chappelle has recently signed a deal to perform and produce three specials for Netflix.